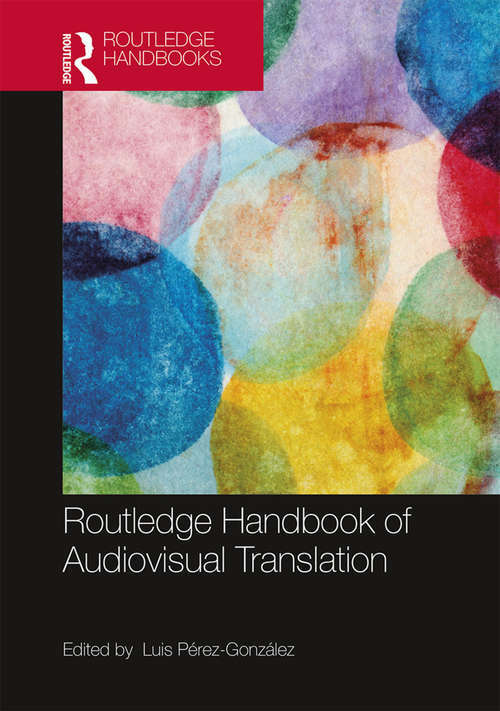 The Routledge Handbook of Audiovisual Translation provides an accessible, authoritative and comprehensive overview of the key modalities of audiovisual translation and the main theoretical frameworks, research methods and themes that are driving research in this rapidly developing field. Divided in four parts, this reference work consists of 32 state-of-the-art chapters from leading international scholars. The first part focuses on established and emerging audiovisual translation modalities, explores the changing contexts in which they have been and continue to be used, and examines how cultural and technological changes are directing their future trajectories. The second part delves into the interface between audiovisual translation and a range of theoretical models that have proved particularly productive in steering research in audiovisual translation studies. The third part surveys a selection of methodological approaches supporting traditional and innovative ways of interrogating audiovisual translation data. The final part addresses an array of themes pertaining to the place of audiovisual translation in society. This Handbook gives audiovisual translation studies the platform it needs to raise its profile within the Humanities research landscape and is key reading for all those engaged in the study and research of Audiovisual Translation within Translation studies.